Spitalfields, just outside the old City of London, is one of the most fascinating areas of London. Nearly two thousand years ago, the Romans buried their dead here; then came a Priory Hospital, followed by Henry VIII’s artillery company. But it is most famous for the Huguenot silk weavers who built the much-sought after early 18C houses here. Their story is one of riches to rags and starvation, and as the area became blanketed by poverty during the 20C, it seemed the whole area would be razed to the ground. The story of the saving of Spitalfields is remarkable, and today we will visit one of the most extraordinary and unique houses in England, Dennis Severs’ house, which evokes the story of a Huguenot weaving family. We will also call in at the church to hear its story. This is either a half-day or full-day tour, depending on numbers. There is an entry charge for visiting the house and a small charge in the church. Kent is not only renowned for its many castles and manor houses but also its cherry and apple orchards and glorious gardens. In an area of outstanding beauty there are some truly wonderful places to visit. 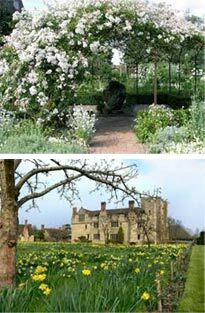 The tour can be tailored to your requirements but typically we would plan our visit to include some of the following: Sissinghurst, with its famous white garden; Hever Castle, once home to Anne Boleyn; Great Dixter, the magnificent creation of Christopher Lloyd, and Pashley Manor, one of the most romantic gardens in Kent. Please contact me for more details and to discuss your group’s requirements. One of the loveliest areas of England – picture-perfect villages of thatched cottages, rolling hills and grazing sheep. Meadows and ancient dry stone walling and gliding streams. And some wonderful gardens. 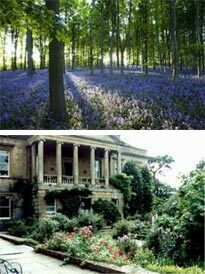 This tour can be tailored to your requirements, but typically we would visit Hidcote Manor and Kiftsgate in the North Cotswolds and on our return journey we will stop off for tea at one of the most delightful villages in Oxfordshire. This will be a full-day tour. Please contact me for more details and your group’s requirements. While you are in London – may be for the Olympic Games – why not take a panoramic tour of the old City of London, the West End and Westminster. See all the main sights: Tower Bridge, the Tower of London, Trafalgar Square, Piccadilly Circus, the Houses of Parliament, Westminster Abbey, Buckingham Palace, the Changing of the Guard. We’ll stop for photos, maybe get out and walk through one of the Royal Parks for a bit. The route can be adapted to suit your interests and timetable. This will be a half-day tour, up to 4 hours. We will be exploring what was historically London’s immigrant area, where Huguenots, Irish and East European Jews have settled, made their mark, and moved on. 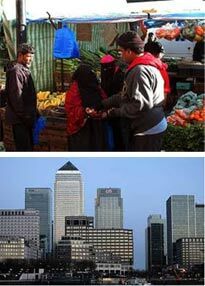 Today it is home to the Bangladeshi living in and around the famous and vibrant Brick Lane, crammed with curry houses. From Whitechapel we drive eastwards, towards Docklands. Here at Canary Wharf, once the bustling hub of the world’s largest docks, now a mini-Manhattan, we see how an area that had become derelict and neglected following the closure of the docks, has been triumphantly regenerated. And then on to Stratford, the heart of the 2012 Olympic Games, for a terrific view of the Olympic stadia. This area too had suffered from centuries of industrialisation and pollution, high unemployment, and poverty. Today, it too is being regenerated as part of the legacy of the 2012 Olympic Games. We might choose to lunch in Stratford, and then visit the world’s largest tidal water mill in a ravishingly pretty setting of cobbled courtyards and oast houses. We will end our tour at Thames Barrier Park for a great view of the Barrier itself and, if time, a cup of tea. 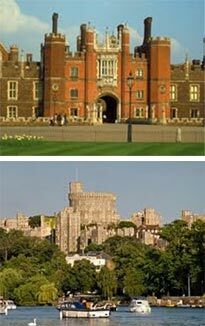 We visit Windsor Castle, the great romantic castle perched high above the River Thames and looking down to Eton College. This is the Queen’s favourite home and the oldest continuously inhabited castle in Europe. It is at once awe-inspiring and homely. We will visit the magnificent State Apartments and St George’s Chapel, where Henry VIII and Charles I, King George VI and the Queen Mother are buried, and where Prince Charles and Camilla Parker Bowles had their service of blessing following their wedding. It is also the spiritual home of the Order of the Garter. If the time is right we will be able to see the Changing of the Guard. Hampton Court Palace, also on the River Thames. Hampton Court Palace was home to Henry VIII where he enjoyed three of his honeymoons. Here his much-longed-for son, Edward, was born. We visit the Great Hall hung with magnificent tapestries, the vast kitchens which cooked for the Court, and the Chapel still in use today. And then out into the extensive grounds, to see the oldest and largest vine in the world, not to mention Henry’s Real Tennis Courts, still played on today. And you may not want to miss the world-famous maze! If you wanted to get on in Society, you would need to ensure that you ‘came to Court’ and that meant not being ‘mean, idle, and unknown’! It also meant knowing how to be presented to the King. So we will all practise getting that right…. This is a full-day tour. On these pages I feature a number of special tours and visits, generally of a half-day or day’s duration. These tours and visits are suitable for groups, societies and schools or colleges, and will often involve travelling by coach. Some complement my talks and lectures. For example, in conjunction with the Spitalfields silk weavers lecture, I can arrange for groups to visit Dennis Severs’ house, once a Master Weaver’s house, and today offering an extraordinary experience which draws us into the lives of an imaginary family of weavers who seem to be still in the house, just out of sight. We’ll also visit the magnificent Nicholas Hawksmoor Christ Church for coffee and a short talk to introduce the extraordinary story of Spitalfields. ‘Discovering London’, the East End and Beyond, Royal Palaces on the Thames: all offer different perspectives on London and its history. The Garden Tours take us beyond London, to visit some of the glories of rural England. This is just a selection of the tours possible. Please feel free to contact me with any ideas or requirements.